What is the meaning of 'Sagrada Familia'? Why is Sagrada Familia So Famous? 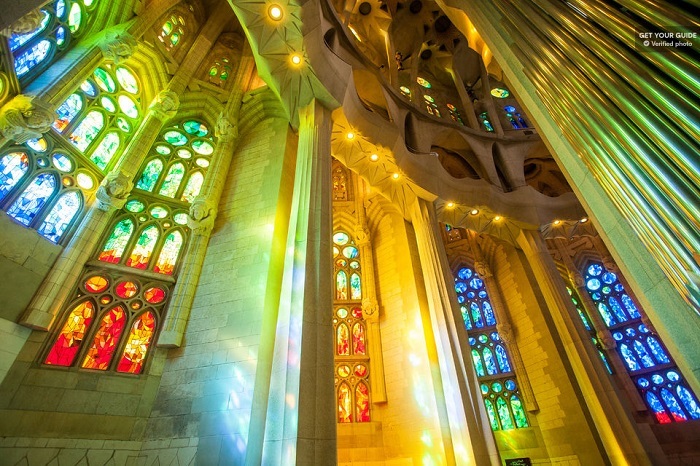 Why is the Sagrada Familia such a must-see attraction in Barcelona? When is The Best Time to Visit The Sagrada Familia? The Sagrada Familia is Barcelona's most iconic structure, and potentially one of the most famous and beautiful churches in the whole of Europe. While it still hasn't been completely finished due to the architect's untimely death before construction was fully finalised, it's still renowned as one of the most spectacular buildings in Barcelona. In this extensive travel guide, you'll find out everything that there is to know about the Sagrada Familia, why it's so famous and all the best tours to embark on while you're there. What is the meaning of Sagrada Familia? The construction of the Sagrada Familia began in 1882 but it didn't actually open until 2010. It is a symbolic expression that's set in stone of the Christian faith; it's an international centre for spirituality and symbolises everything that's synonymous with love, peace, faith and harmony. The meaning of Sagrada Familia literally translates to 'Holy Family' or 'Scared Family' and it perfectly encapsulates what the cathedral is intended for. The design of the church symbolises true magnificent and grandeur and is famed for being a towering masterpiece in the city of Barcelona. The impressive church is so famous and so important, simply due to its incredible design and expansive dimensions. The beloved architect, Antoni Gaudi, worked on the Sagrada Familia for most of his life, until his death in 1926. Even though the church isn't actually home to a bishop's seat (which is usually the deciding factor on whether or not a building is classed as a cathedral), Gaudi made it abundantly clear that he thought the city of Barcelona would someday be known for his "cathedral". In almost every travel guide that you read about Barcelona, you will see that the Sagrada Familia is nearly always stated as the number one must-see attraction in Barcelona. The medieval cathedral is a true wonder to behold and despite it still being under construction, it's still a truly impressive sight to see. La Sagrada Familia attracts over 3 million visitors each and every year and is the most visited monument in the whole of Spain. While the Sagrada Familia is absolutely beautiful to visit at any time of year, during any season, there are certain times that are considered better to visit the world-famous structure. As a general guideline, you'll probably need around an hour and half to get a good feel of the Sagrada Familia, in order to see both the interior of the basilica as well as the two towers. The Sagrada Familia is open just before 9am every single morning so it's a good idea to get there at least 15 minutes before as queues will have already started by that time. Between 9am and 12pm is generally considered to be the best time to visit the Sagrada Familia, especially if you've booked tickets in advance. If you're looking to capture the basilica in the most beautiful and natural sunlight, you should aim to be inside the cathedral between 10.30am and 11.30am as this is when the sunlight enters the basilica at the most spectacular angle. The evening time between 5pm and 6pm is also a good time to visit the Sagrada Familia as the sunset casts a truly gorgeous light through the windows. However, if you're not actually too interested in going inside the cathedral, and just want to take pictures of the exterior then pretty much any time of day or night is ideal to capture epic shots. The crowds do tend to get extremely busy around the Sagrada Familia at pretty much all times of day, but early mornings or later into the evening is probably the best time to capture a picture with as few people in it as possible. The Sagrada Familia really is one of the most incredible structures in Spain and for good reason; its architectural design is truly phenomenal. The interior of the church building is thought to be based on a five-aisled basilica, with the middle part obviously towering above the other four. Each of the five aisles are assigned to a gate that belongs to the unfinished glory facade. The flooring of the church is covered in a smattering of religious symbols, as well as almost every single door, column and individual area having their own unique symbolic significance. A large proportion of the interior is made up of a vault-and-pillar system, the nave, and the apse where the altar resides. The Sagrada Familia is also actually one of the largest church buildings in the world, with the entrance to the apse (one half of a dome roofed area) at 90 metres, and the five naves totally 60 metres long and 45 metres wide each. The interior of the Sagrada Familia really is just as astonishing as the exterior and you can be assured that you could spend hours getting lost inside and admiring the impressive feat. Antoni Gaudi intended for there to be 18 towers present at the basilica of the Sagrada Familia but only eight of them are actually fully completed as of now; four on the Nativity facade and four on the Passion facade. The Nativity Towers offers stunning views over the east side of Barcelona and are considered to provide some of the very best views of the whole of Barcelona. Passion Towers on the other hand, face the city centre of Barcelona and give an unparalleled view of the stunning streets of the city. The below table includes a brief description of various handpicked tours of the Sagrada Familia. They're based on customer reviews, cost, customer experience as well as all the best ways to see the famous Barcelona sight. "It was an excellent way to start my trip." "Our tour guide was very informative and entertaining." "It was a really good idea to buy it online!" "Our guide was super knowledgeable and very kind"
"Our guide Norbert was fantastic!" "Thank you very much for an unforgettable visit to Sagrada Familia." "Our guide was very thorough"
"It was a great tour, Guadaloupe was very good and informative"
"A good tour in a stunning place"
"Judy was our guide and she was very informative"
"Gloria was our guide for the full day tour and was excellent"
"Great experience good service for tickets"
- "Charming and competent tour guide." 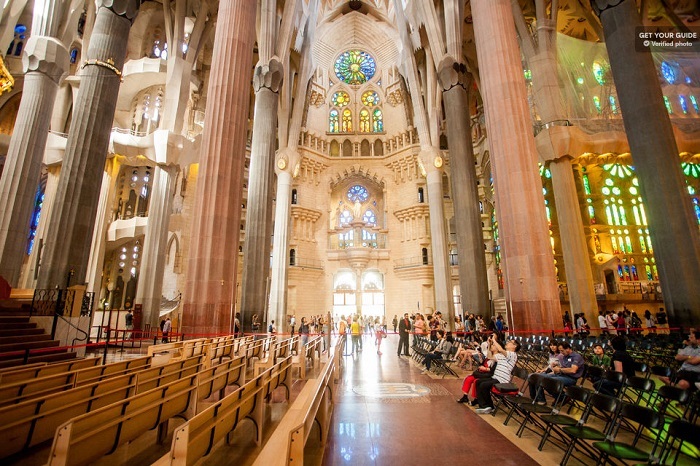 This Priority Access: Barcelona Sagrada Familia Tour is incredible value for money at just over £34. Included in the price of the tour, you'll get priority access which means you won't have to queue for hours to see Barcelona's most impressive piece of architecture. When visiting the Sagrada Familia, you must ensure that you dress appropriately, even if you're not religious, in order to show your respect as it is a place of worship and faith. The museum will have you selecting some of the finest souvenirs to take home with you in order to remember your incredible trip. The fast-track tour of the Sagrada Familia truly is great value for money. On the tour you'll get to experience the remarkable work of Gaudi and what he aimed to achieve with his cathedral. Despite it being unfinished, you'll still have an amazing time wondering around the basilica and admiring its impressive size. Even though all the towers aren't fully complete, you'll still gain a unique insight into what Antoni Gaudi wanted to achieve with his architectural design. 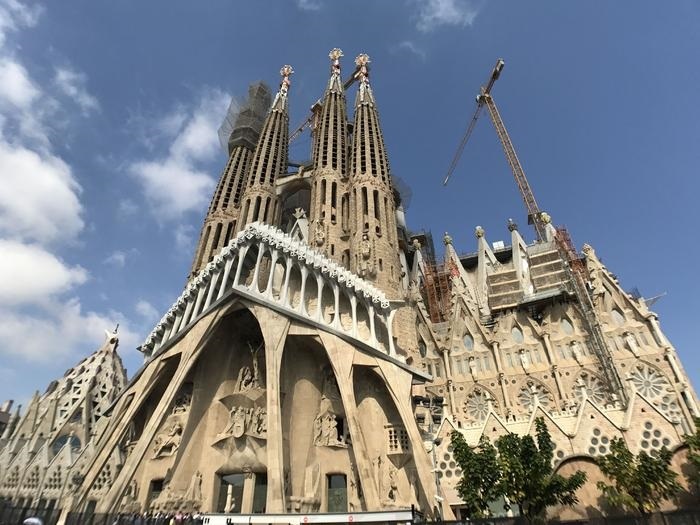 With this skip the line tour, you'll get a chance to see the Sagrada Familia without the hassle and inconvenience of enduring long queues, which means you'll to see the sights much quicker. You'll also be able to see the Sagrada Familia itself as well as the stunning Park Guell which you'll be taken to via car. The tour of the park will begin at the spectacular Guell's icon, where you'll then proceed to wander around the park and learn more about its history. The Fast-Track Sagrada Familia Ticket and Passion Tower Access is a great tour to embark on while in Barcelona. You'll get to explore the Sagrada Familia as well one of its famous towers; Passion Tower. Admire the impressive Gothic and Art Nouveau architecture and see Gaudi's life work in real life. As the tour is fast-track, it means that you won't have to queue for hours on end to get inside the basilica, so you have much more time to explore the surroundings. Make your way up the towers of the Sagrada Familia and admire the incredible views over Barcelona from the top. Learn all about the life work of Antoni Gaudi and what he intended to do when he first started construction on the Sagrada Familia. For only £43, you'll get access to the cathedral, the towers as well as a tour guide who can provide you with plenty of valuable information, ensuring your tour is as enjoyable and informative as possible. On this guided tour of the Sagrada Familia and the towers, you can learn all about the history of the cathedral, when construction originally started and the inspiration behind Antoni Gaudi's stunning Sagrada Familia. Choose from a half day or full day of exploring Barcelona including the beloved Sagrada Familia. This tour is ideal if you're short on time while in Barcelona as you can choose from the half day or full day option. You'll get to walk around Barcelona's famous streets and take in all the impressive sights. Finish off your tour of Barcelona with a visit to its most-iconic structure; La Sagrada Familia. With this fast-track tour and Nativity Tower access, you can enjoy amazing views of Barcelona city, as well as exploring the whole of the Sagrada Familia at your own pace so that you're not rushed for time. You'll get to walk around at your own pace, so you won't feel rushed into seeing everything. La Sagrada Familia Guided Tour is fully informative and engaging and will ensure you learn so much about the most iconic structure in Barcelona. You'll also get the chance to learn more about the religious practices of the church. This fully guided tour will provide you with a plethora of information and intriguing facts about the life of Antoni Gaudi. You'll discover some of his most eclectic work, including the Sagrada Familia which is now the most famous and most visited landmark in the whole of Barcelona. Planning a trip to Barcelona will likely involve a lot of organisation and preparation to ensure your itinerary is full and you can rest-assured that you'll have plenty to see and do while there. The best way to start your Barcelona trip planning is to use Barcelona attractions maps so you can see where everything you want to visit is on the map. If you're looking to save a bit of money while on your trip, especially if you're booking numerous things to do while there, then you should look out for free things to do in Barcelona, and when you are booking tickets for various attractions, make sure to look out for the best Barcelona attractions tickets deals. This will not only help to save you money on the cost of tickets, but you'll also be able to explore more of what Barcelona has to offer. One of the best ways to get around the city, as well as making sure you get to see everything is by booking to go on one of the Barcelona bus tours. The Barcelona City pass is also another excellent way to ensure you'll see everything in the city; this is especially good if you're pressed for time while you're there. A trip to Barcelona is something that's on many people's travel bucket list! From the impressive architecture, to the stunning parks, all the way to the most famous landmark of La Sagrada Familia, Barcelona has plenty to offer everyone!